Four Maryville College students from the Division of Mathematics and Computer Science presented their summer experiences today to a crowd of Scots Science Scholars, math and computer science majors, and other interested students today. 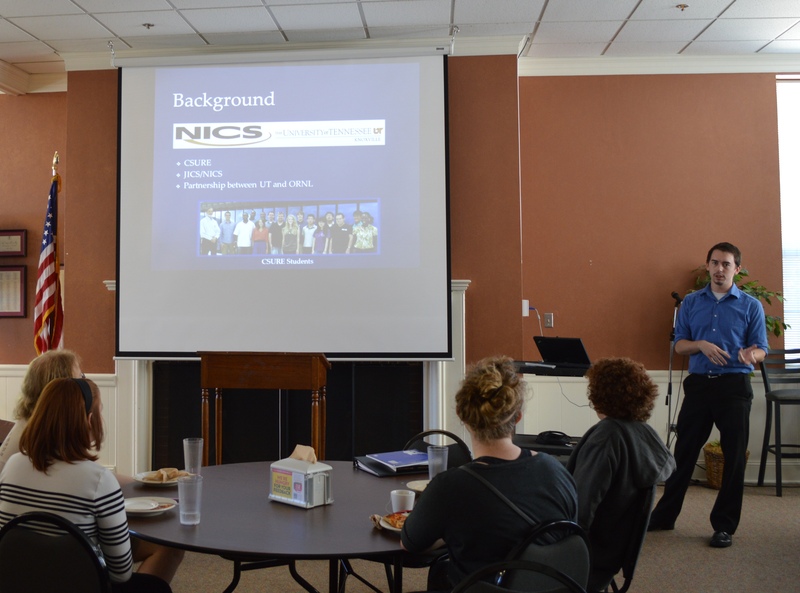 The informal presentations were a way to get the word out about the variety of work that one can undertake with one of the majors offered by the division. 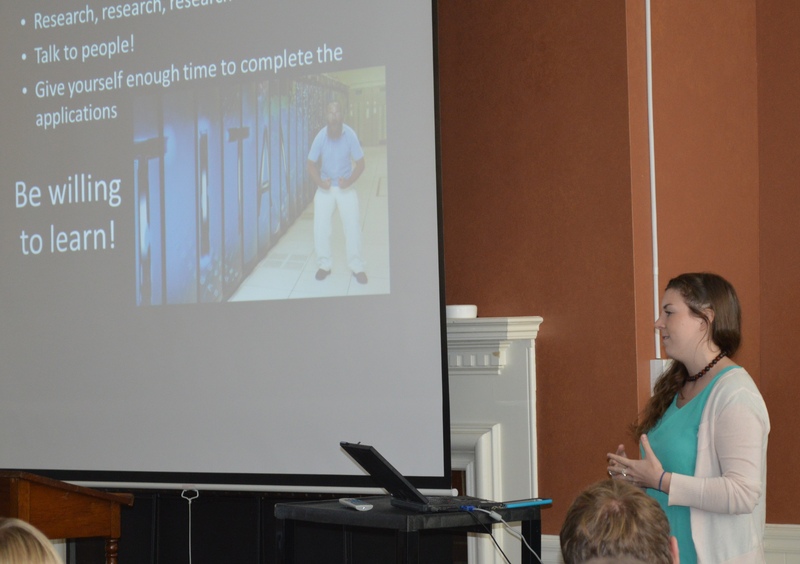 The first presenter was Hannah Fry, a senior math major and physics minor who spent the summer working on environmental modeling at the Oak Ridge National Lab. Hannah’s project required her to stretch her programming skills to fill as she worked on satellite image data. As satellites collect data around the globe, scientists are using the images to make inferences about what kinds of environmental changes are occurring at various locations. Hannah’s job was to fill in the ‘gaps’ in the data caused by obstructed views or other interruptions. She applied two different interpolation methods to eight years of data on the state of Ohio to analyze the differences between them. Hannah’s advice to students was to put themselves out there and not be afraid to take on the challenge of an internship at the labs because the experience was such a valuable educational and vocational one for her. The S3 students were already familiar with senior math major Travis Sellers who served as one of the program’s peer mentors. Travis spent part of his summer at Miami University in the Summer Undergraduate Mathematical Sciences Research Institute. He is the third Maryville College student to attend this program in recent years. Travis talked about his project analyzing crime rates at large universities around the country. His research group was able to identify Greek life and the diversity index of the surrounding community among the factors that affect crime rates on college campuses. Like Hannah, Travis encouraged the group to seek out similar opportunities. He emphasized that the summer experience not only reinforced his desire to attend graduate school, but helped him to narrow his interests to studying statistics once he gets there. Senior computer science major David White spent the summer at the Joint Institute for Computational Sciences. He worked on one of the fastest super computers in the world, the Kraken. The group he worked with considered the problem of modeling physcial systems like the human heart which require complex interaction among different models from physics, including fluid flow, electric charge, and mechanical stress . Parallel computing has become a valuable tool as scientists discover they need to be able to perform multiple calculations at once as they seek to make more realistic models of the natural world. This was David’s second internship experience, having worked at ORNL previously. David stressed the importance of doing well in classes, but also of developing good relationships with professors and mentors as well as extra-curricular activities as important ingredients in a strong application for a competitive internship. An industry internship was a very good fit for junior engineering major Sean Yoder. He worked at CB&I in their energy division. Sean’s job was to make sense of the different regulations from the federal, local and company level and help engineers put those together as they build new power plants in Georgia and Virginia. The highlight of Sean’s summer was getting to tour the facilities and see the process of how a nuclear power plant produces energy from beginning to end. Sean stressed the need to make connections when seeking an internship. No doubt these skills will come in handy as he makes the transition to engineering school next year. 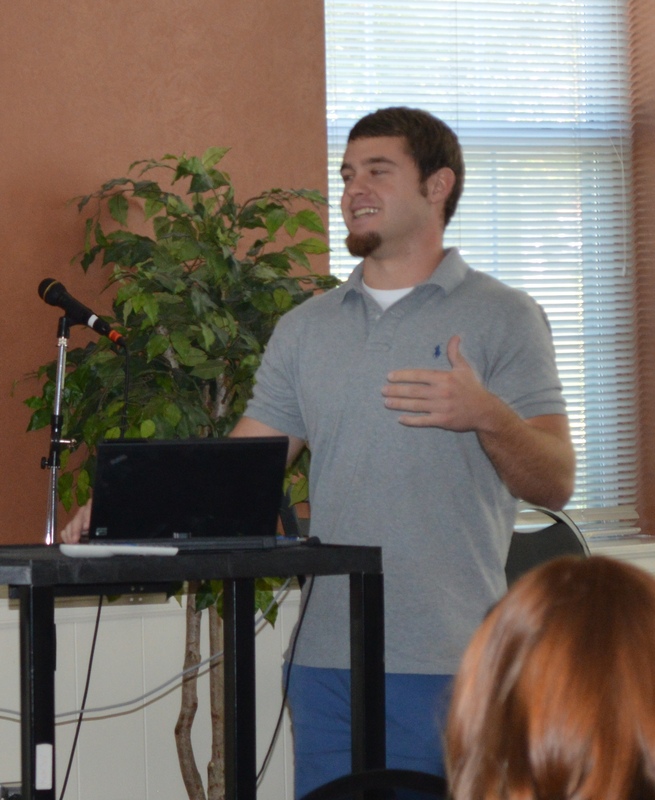 It became clear to the audience as these students were speaking that their education and experiences at Maryville College were a good preparation for the kinds of work people do in the fields of mathematical and computer science. It was also clear that the kinds of relationships they have built with faculty here at Maryville College have served them well in their journeys through college into the world of work. All of the students mentioned being challenged in some way, but all of them also met the challenge head on. This entry was posted in Uncategorized and tagged CB&I, Computer Science, Maryville College, mathematics, Miami University, Oak Ridge National Laboratory, Scots Science Scholars, Summer internships, SUMSRI. Bookmark the permalink.